It’s a bird! It’s a plane! It’s… SUPERMOON! Oh, is it that time again? The time for everyone to overhype the “Supermoon”? You’ve probably heard about this: on June 23, the full Moon will be the biggest and brightest of the year, so it’s called the Supermoon. Let me be clear: While this is technically true, you’d never notice the difference in size or brightness by eye. The full Moon will look pretty much like every other full Moon you’ve ever seen. Which is to say, big, bright, beautiful, and completely worth your time to outside and see! 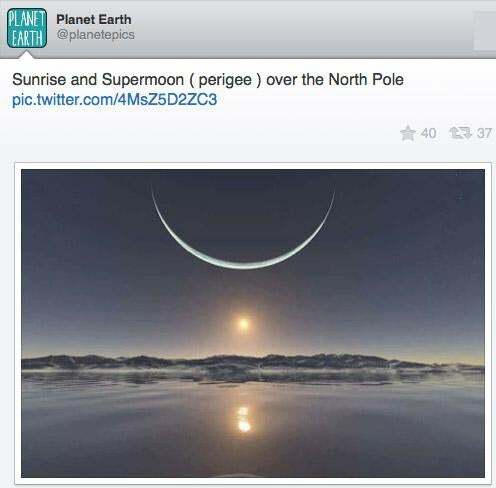 But Supermoon? Not so much. Here’s the deal. The Moon orbits the Earth once every month or so. As it does so, the geometry—the angles between the Moon, Earth, and Sun—change, so we see a different part of the Moon lit every night. Once per orbit the Moon is roughly opposite the Sun in the sky, so the half facing the Earth is completely lit, and we say the Moon is full. This blog post I wrote (complete with awesome video) should help. While the caption is technically correct, the exaggerated size of the Moon in the (almost certainly faked) photo will give people a very wrong idea of how big the Moon will be. Photo of unknown origin, but it’s all over the web. But those are averages; the actual numbers month by month are all a bit different. 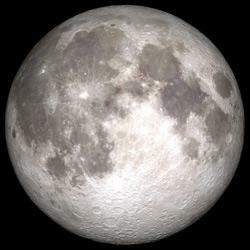 The full Moon on June 23 will occur when the Moon is just a hair under 357,000 km (221,300 miles) away, the closest perigee of the year. The phase of the Moon and its distance from Earth are not connected in any way; a full Moon can happen when the Moon is at apogee, perigee, or any point in between. 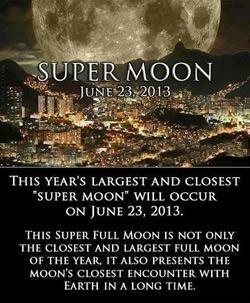 It so happens this June 23 full Moon occurs just 20 minutes after perigee, so it really is about as close as it can get. That’s pretty nifty timing! 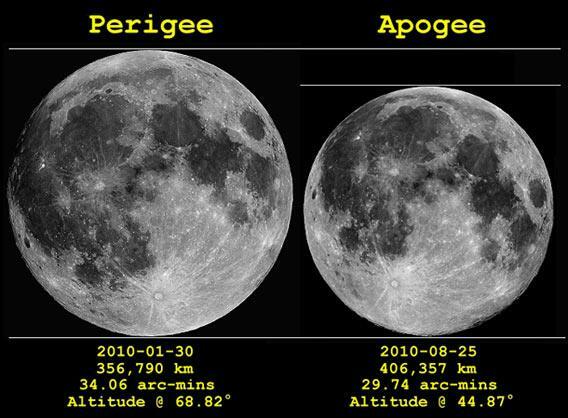 The difference between a perigee (left) and apogee (right) full Moon. 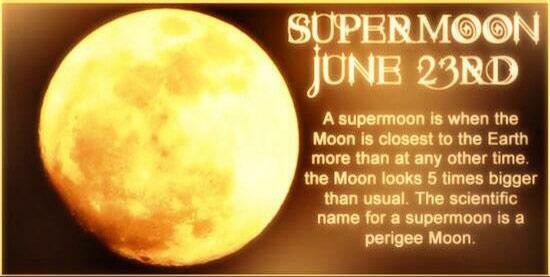 So does this mean the Moon will look huger and brillianter in the sky? Not really. Last month, the full Moon happened when it was just over 358,000 kilometers away—only a little bit farther (by about 1 percent) than it will be this month. Even if you compared last month’s full Moon with this month’s “Supermoon” side-by-side you’d hardly notice it; you’d never notice the difference just by going out one month to look, waiting a month, and looking again. Heck, the difference between the two extremes of apogee and perigee is only about 40,000 km (25,000 miles)—about a 10-15 percent difference overall, making the Moon look 10-15 percent bigger at perigee. Even that wouldn’t be spotted by eye, especially with two weeks separating the two observations (not to mention the change in the phase of the Moon throwing your sense of scale off). Also, the Moon is a lot smaller in the sky than you think, so a small change is even harder to spot. If the Moon looked five times bigger tides would be over 100 times stronger, and we’d have bigger worries than debunking bad astronomy. Photo of unknown origin, posted by various people on Twitter. I have no doubt that people will still claim they can see the difference, and that the Moon looks much larger and brighter (and don’t confuse this with the Moon Illusion, where the Moon looks bigger on the horizon than when it’s high in the sky). I would bet a lot of money that’s just the power of suggestion; if they hadn’t heard about the Supermoon in the first place they wouldn’t have even noticed any change. Because there’s no real change to notice! This Supermoon silliness happens every year; it started in 2011 and happened again last year. Some people even claimed the big 2011 earthquake in Japan was caused by the Supermoon, but that’s simply not true. The only real physical effect is on the tides, which are slightly stronger when the Moon is closer to the Earth, but that happens every month. We’ll have somewhat bigger tides on June 23 because the tides are larger when the Moon is full—its alignment opposite the Sun in the sky means their forces add together, slightly amplifying their combined effects—but it’s not that big a deal. Arg! This is actually a piece of artwork of an alien world, called “Hideaway”, and has nothing to do with the Earth and Moon. Artwork by Inga Nielsen, tweeted by PlanetPics. Tip o’ the lens cap to FakeAstroPix. Of course, facts have never stopped people from promoting fiction. 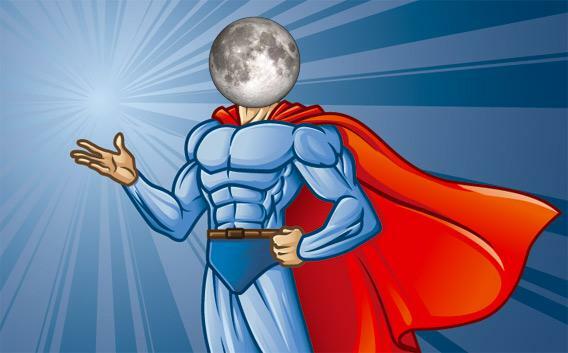 A lot of folks are exaggerating the effects of the Supermoon, from plain overhyping to total nonsense. I’ve scattered a few images of such things throughout this post. An illustration of what the Moon will look like on June 23, 2013. Now, after all that humbuggery, let me say this: Go outside and look at the full Moon! It’s gorgeous. It always is. If you have normal eyesight you can spot light and dark areas—the blue-gray regions are called maria, Latin for “seas”, because it was once fancifully thought that’s what they are. In reality, they are vast areas where gigantic asteroid impacts billions of years ago flooded the surface with dark lava. Reality is, as usual, way cooler than what we imagine. Through binoculars, you can clearly see the shapes of the maria, and several large craters are visible as well. If you have even a small telescope the Moon comes alive, saturated with craters, the younger ones with tremendous delicate rays of material stretching away from them. The Moon is up every day at one point or another, either during the day or during the night (or both), shining down on us as it has for eons. It’s easy to take it for granted, to not really think about it. I’m not a fan of hype like the “Supermoon”, since it gives people a false sense of what’s really going on, but it does serve one purpose: It’ll get people outside looking up. And that’s fine with me, as long as they understand what they’re seeing. And even then, just appreciating the beauty of our nearest celestial neighbor is an end unto itself.